HEY-YO! I'm Kelly and I'm so happy to be here at Hopscotch. Kaya and I first met when she delivered a cake to my mom's 60th birthday party in October of 2015. She dropped off the cake, complimented my dress and ran back out to her car with her earbuds in... love at first sight! HA! 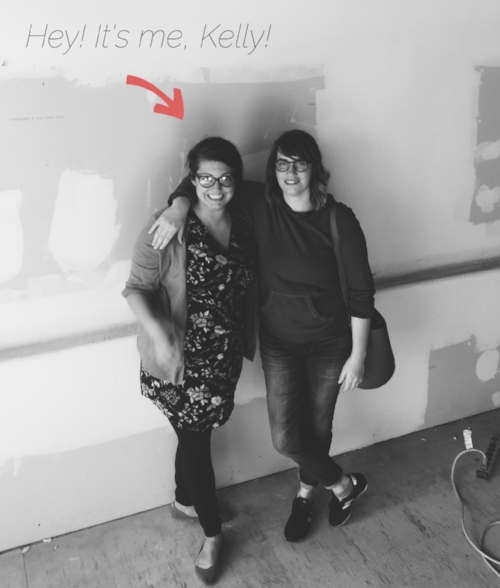 I started following her and Hopscotch... and when I found out that she was moving in to Art Mart (my happy place) I was stoked! I can't tell you how many times we've celebrated a small victory with a treat from Hopscotch (my mom always treats me to Hopscotch after an art show). It seems pretty cheesy, but Hopscotch has been important to me WAY before I became a part of this team. Besides the fact that Kaya is one of my favorite humans, I wanted to be a part of Hopscotch for one reason: authenticity. I strive to be the most authentic version of myself, and with Hopscotch I don't feel like I'm giving up any part of who I am, but extending who I want to be. Our goals are so aligned it's borderline frightening: but thats what you want in a partnership, right? No, I don't bake... that's Kaya's thing! Until our doors at the Bakery + Market are open, I will be managing the renovation of the lower floor of the building and making sure Kaya gets the kitchen of her dreams. I can't wait to meet all of you, new customers, faithful followers, and all you sugar junkies. You guys are helping us build the life of our dreams... thank you.